The addition of larger 4.2" LCD screens on the Nintendo DSi XL (or DSi LL) may initially lead one to believe it's targeted at old folk. But its larger, wider viewing angle screens give the portable platform additional appeal. Nintendo president Satoru Iwata said at the company's semi-annual financial briefing that the boost in LCD screen real estate is obviously easier on the eyes, but that "Nintendo does not offer such new product for such limited purposes only." "Many people see a portable video game device as the device that can be played by yourself wherever you are," Iwata contends. "In fact, portable video game systems so far have been developed by prioritizing the portable nature and single-player modes." Not the DSi XL! It addresses the lack of "a beautiful view from any angle," Iwata says, offering a "new play style." "Nintendo DSi XL realizes beautiful game screens even for those who look at them from an angle," Iwata claims. "You do not have to peek closely into the monitor of another player's video game to get a good view anymore. Nintendo DSi LL is going to offer a new play style, where those who are surrounding the game player can also join in one way or the other to the gameplay. When you look at the home console video games you can understand that the fun of great games can be conveyed to and shared by those who are watching the player play." In other words, Nintendo is attempting to transform the image of the Nintendo DS from portable platform only to portable platform that's also a console to be played at home in groups. Iwata pointed to the Nintendo DS Mii collecting game Tomodachi Collection—a bestseller in Japan—as an example of a title which "whose appeal can by multiplied and enjoyed by bystanders." 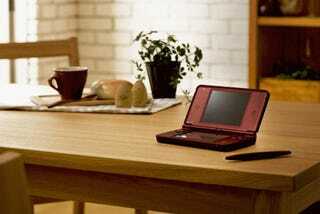 The Nintendo DSi XL, Iwata says, is the "first portable video game system aimed to be played with others in person." In doing so, Nintendo expects DSi XL to accentuate the "fun feature" of software, potentially making the game "an unexpectedly huge hit." We're ready to test this theory at Kotaku Towers, already planning our Nintendo DSi XL launch parties, in which we invite a wholesome group of culturally and ethnically diverse friends, tentatively scheduled for early 2010.